Every organisation strives for a secure premise. To achieve this, an Access Control solution with digital capabilities is essential. Beyond traditional security, Access Control solutions are influential in helping organisations reinforce zone restrictions and improve on-site security.Valued by numerous industries including; Government, Pharmaceutical, Aviation, Education and more, many organisations understand the importance of deploying a solution that can create restricted areas and protect the people, property and assets of each premise. In this feature article, we discuss the many benefits associated with modern Access Control solutions. No organisation wants their employees or visitors to have the full accessibility of their facility. To improve zonal security and to reinforce zone restrictions, Access Control solutions can be deployed and configured to set access authorities, limiting access to personnel to only ones that require it. In traditional security practices, physical keys are used to gain entry to restricted zones. Unfortunately, in a world full of threats, this security method is not as effective as it once was, with key duplication being a relatively quick and simple process. ID badges, facial recognition and biometric readers are just some of the available modern Access Control reader options, these options are not only much more difficult to duplicate without the correct equipment but are almost impossible to configure without back-office authorisation. If an event occurs and security wish to investigate who committed the crime, the Access Control back-office maintains a record of every gateway transaction, allowing security to create a list of suspects that entered and exited the zone where the act occurred. To further improve on-site visibility, Video Management solutions (CCTV), Vehicle Management solutions and other value adding integrations can be paired with a modern Access Control solution. Most modern Access Control solutions are designed to control more than just doors and gateways, they also have the capacity to be configured for controlling high-speed barriers, turnstiles, motorised fences and parking gates among other things. For security, this is an element of Access Control that allows teams to work more efficiently with less staff being required for monitoring. Additionally, by integrating Access Control to multiple areas of a facility, security processes are substantially improved as threats and unwelcome visitors would be required to gain authorisation at more than one entry point, increasing the likelihood of their presence on-site being detected. Its common for staff and other stakeholders to be operating from multiple sites, Access Control improves accessibility for these individuals by configuring ID badges with multi-site permission. Not only does this improve mobility for these individuals but by configuring a single ID badge to provide multiple access permissions, security standards are improved by limiting the number of ID badges in circulation. Most digital Access Control solutions can be integrated with a wide range of third-party applications and solutions, some of which can be utilised to save energy and costs on-site. For example, the most sophisticated facility management solutions enable personnel to identify areas of the site that require heating/cooling at a specific time. By closely monitoring variable overheads such as light and heat, energy costs can be substantially reduced by increasing the accuracy of on-site facility management. In addition to facility management integrations, many global organisations also integrate with value-adding solutions and applications that are already deployed on-site. Video Management (CCTV), Vehicle Management, Time and Attendance, Emergency Evacuation Planning and Alarm systems are some of the most popular and common integration options availed by large organisations for controlled access of employees, visitors, contractors and other third-parties. 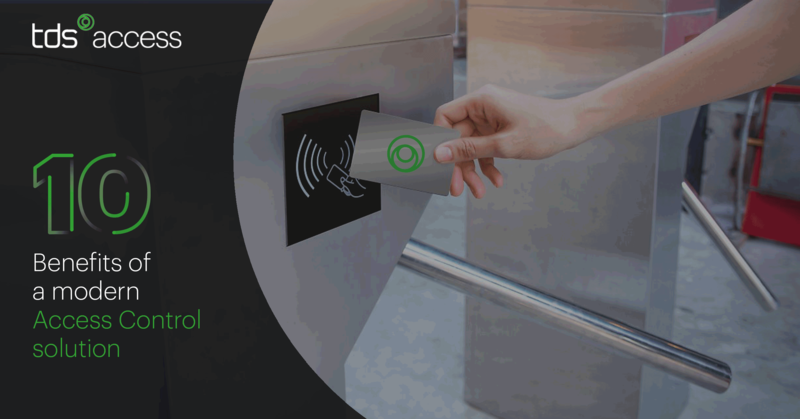 Along with modern Access Control solutions being highly configurable, they also have the capacity to record and store information relating to every gateway transaction from every ID badge. When an ID badge is scanned, the Access Control solution is prompted to record the time, location and Id badge number. These details help authorised users identify which employees have access to each location and also identifies the punctuality and productivity of employees. For organisations with over 100 employees, it can be difficult to maintain an up-to-date list on which employees have access to certain zones and which employees are in possession of one or more physical keys. If an employee joins or departs an organisation with a digital Access Control solution, authorised personnel can perform some simple configuration in the back-office to chance access authorisation to provide or restrict access or even replace a lost ID badge. In the current market, most Access Control solutions are SaaS-based and have a back-office that can be accessed through a web-browser. This allows organisations to quickly and easily improve the scale of the solution from a couple of domestic sites to global scalability.